Our Listeners of the Week are Marc for his donation, our 68 Patreon Patrons, including Ron W. who also talked us up to SVS CEO Gary Yacoubian at a live event. Thank you! In the news, SVS has removed the Plus Series of subwoofers from their website, but they all but confirmed for us on Twitter that a new SVS 3000 Series are coming to replace them. Promising news on the Apple TV 4K Atmosfront as Atmos titles are now appearing in iTunes, and the audio is switching automatically. The Panasonic UB820 Ultra HD Blu-ray player is the first device to support both HDR10+ and Dolby Vision. And the 8K resolution Samsung Q900R QLED TVs leaked before their official announcement at IFA, although it’s a good idea to familiarize yourself with where 8K stands today. Chris H. updated us on his plans to improve his dialogue intelligibility by moving his Center speaker closer to seated ear height. And Jason S. let us know that after some HDMI troubleshooting, Marantz is repairing his SR7011 that was purchased from Accessories4Less, meaning they’re honoring their warranty on refurbished units as promised. 0:16:55 Infinite Gary finds out that we’re interested in seeing new 4K JVC projectors and the Emotiva RMC-1at CEDIA. Then we discuss why even calibrated displays don’t all look identical, we talk about peak nits and understanding light output, we go over rules of thumb for placing speakers close to walls, and we reassure Gary that a turntable with a built-in phono pre-amp doesn’t need a ground wire. 0:32:59 Nick B. is delaying construction in his basement, but wants to buy new toys in the meantime. We go over his options for Atmos speaker placement, and talk a bit about which settings to use for HDR with a JVC projector. 0:42:11 Joseph S. gets our opinions on which streaming box is best. 0:46:04 Brian R. asks for our take on the Definitive Technology SuperCube 2000 and Aperion Bravus II 10D subwoofers, which leads us to recommend the RSL Speedwoofer 10S if you want a smaller, less expensive sub. Then we say how we’d allocate our funds for a speaker upgrade. 0:53:45 Karl R. prompts a discussion about brand loyalty and sometimes paying more to stick with a familiar brand. 1:03:48 Josh B. wants a Dolby Vision Ultra HD Blu-ray player that will work with his Sony TV, so we mention the Panasonic UB820 and Sony UBP-X700. Then we talk a bit about the Xbox One S/X as an Ultra HD Blu-ray player, and whether Ultra HD Blu-ray versions are worth the price in general. 1:09:15 Jack R. found a data-bass forum thread detailing individual bass EQ settings for certain movies. We share our thoughts, and then talk about plotting the spectrum of an audio recording to see if any filtering is being applied to the signal. 1:17:19 Dennis N. asks about how to set each of the knobs on the back of his subwoofer prior to running room correction, what Reference Volume is all about, and what we think about using keystone correction on projectors. 1:26:41 Raul R. wants earphones with great sound quality at a reasonable price, so we point him straight to The Wirecutter’s pick: the AKG Y20U, while also mentioning RBH earphones. 1:30:41 Brandon N. asks which acoustically transparent screen fabric from Seymour AV would be his best choice. 1:33:01 Ryan T. wants to know whether fiberglass or rock wool insulation carries any health concerns. 1:35:24 Chris T. asks if sounds get redistributed when you use an audio upmixer, and what the mobile version of Dolby Atmos is all about. 1:37:56 Ron W. gets some clarification about making manual settings adjustments after running auto-setup on your Receiver. Then we talk about wide color settings for his Epson 5040UB projector, using the R. Masciola HDR-10 test patterns and Netflix test patterns, and recommend The Martian as excellent comparison material for HDR and wide color vs. SDR and Rec.709 color. 1:48:59 Bobby M. gets our recommendation for the Outdoor Speaker Depot ICE650 in-ceiling speakers if our favorite – the MK650 – are unavailable. 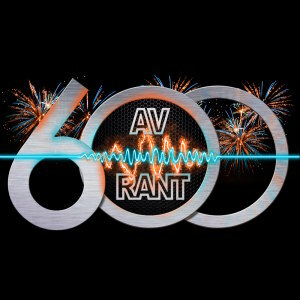 AV Rant #607: Left Wall Open Room Layout AV Rant #605: We Love Atmos?